Your recipient will be delighted with the card and you can sit back and glow in the praise from your creation. The Grand Ovals can be used in many ways to add that special something to your cards and the video tutorial will show you how to create another style to add to your repertoire. In this set of dies from Spellbinders you will find the Grand Decorative Ovals, Grand Scalloped Ovals as well as the plain Grand Ovals and all of these will work together and will help you to produce a really stunning card. Use them as an addition to another style of base card or make them completely into the base and build from there. The video is not long but will give you another way to use these versatile dies. Then how you add the decoration will be determined by the occasion for which it has been created. 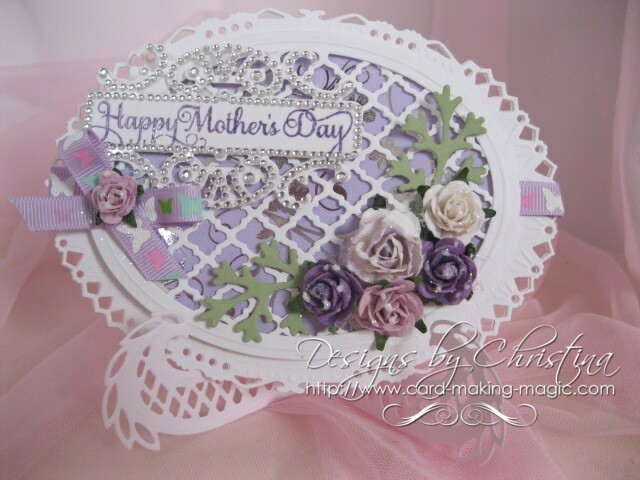 The card above has been made as a Mothers Days Card and added to a stand. The smallest die from the Grand Decorative Ovals is the perfect size to fit onto the stand without it falling over. I have stamped it in turquoise and then embossed it in clear fine detail powder. This is much easier then embossing with colored powder and having specks of it on your work. The addition of flowers, ribbons and pearls to your card can make it truly feminine and is ideal for a birthday or Anniversary card. Or keep the colours more muted and add in typically male items like some string or a few buttons, for the men in your life. 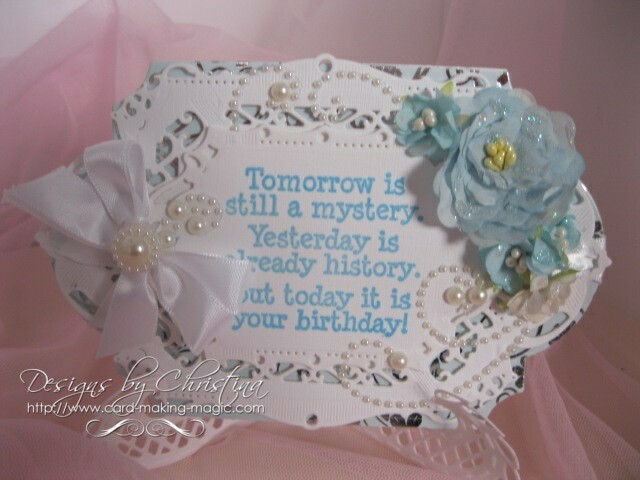 And although a really lovely card it is very easy for you to make and will elevate your cardmaking to the next level. New dies are being added all the time but the basics are still essential as a way to make the base of your designs.